Simply put, an Enhanced Ground Rod is a conductive hollow tube ground rod. They contain special hygroscopic, electrolytic salts. These salts form a saline solution by absorbing moisture out of the atmosphere. This saline solution leaches out of the bottom of the rod, which gradually lowers resistivity of the surrounding soil, forming “electrolytic roots” over time. Don’t fall for the “maintenance free” claims. In order for the EGR to work effectively, salts must leach out over time. 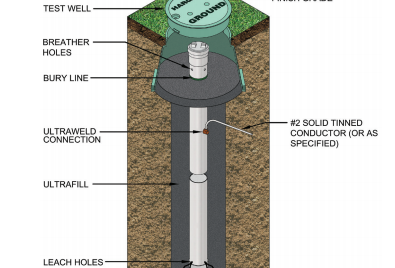 Water standing in the access well will prematurely leach the salts out of any rod. If the EGR doesn’t allow for the refill of electrolytic salts, the entire unit must be replaced in order to maintain the initial system designed resistivity levels.